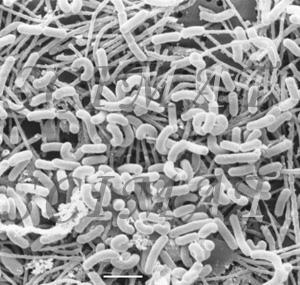 Lactobacilli are characteristic members of the lactic acid bacteria group. They vary in morphology from long, slender rods to short coccobacilli, which frequently form chains. Some species tolerate air and may utilize oxygen, while others are strictly anaerobic. They all grow best in a slightly acidic medium at pH 5.5-5.8. There is a wide variety of lactobacilli. 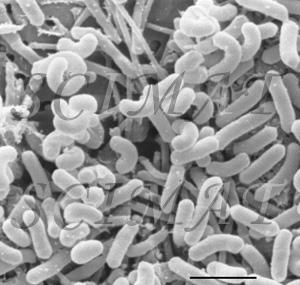 Scanning electron microscopy images of Lactobacillus casei and Lactobacillus rhamnosus are presented at this site but Lactobacillus acidophilus and L. bulgaricus are shown separately. According to Dr. Magdalena Kostrzynka, L. casei and L. rhamnosus are now two different species (for details please see Klein et al.). Lactobacillus GG (ATCC 53103) was initially classified as L. acidophilus, later classified as L. casei, and recently reclassified as L. rhamnosus GG. These changes have to be considered when searching for one of these lactobacilli on the Internet. 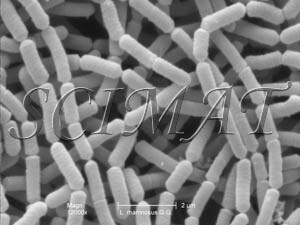 Lactobacillus casei are Gram-positive, facultatively anaerobic, non-motile and non-spore-forming, rod-shaped members of the industrially important lactic acid bacteria. They are found in dairy and also plant products and in the digestive tract of humans and animals. Lactobacillus casei Shirota strain is the main microorganism used to produce Yakult, a cultured dairy drink. Lactobacillus rhamnosus strain GG (LGG) has been shown to be effective in the treatment of several forms of diarrhea in humans, including acute rotaviral and non-rotaviral diarrhea in children, "travellers'" diarrhea, antibiotic-associated diarrhea and relapsing Clostridium difficile diarrhea in placebo-controlled studies. To be effective, probiotics must possess, among other properties, the ability to survive acid and bile digestion, and colonize the intestinal tract. Other studies suggest that LGG may decrease colonization of the respiratory tract by pathogenic bacteria. L. rhamnosus was found to increase natural and acquired immunity in healthy mice. As part of the Lactobacillus spp., L. rhamnosus is beneficial to human health as well. 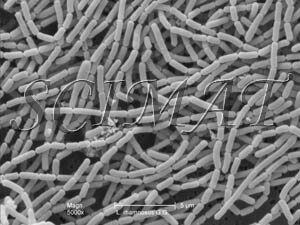 Lactobacillus rhamnosus GG culture was provided for scanning electron microscopy by Dr. Magdalena Kostrzynska and Mr. Dion Lepp. For additional information on foodborne bacteria please see these links.